How Does Math Make You Feel? 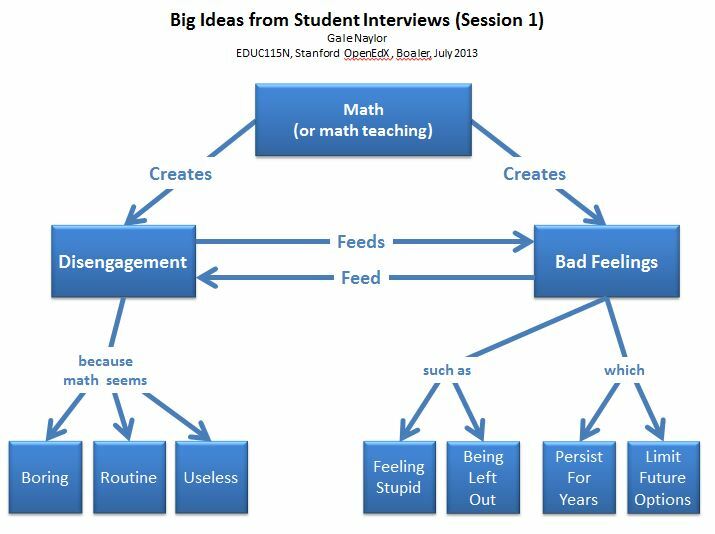 Well, I hope math doesn’t make you feel like the Stanford University freshmen (see the concept map, above) who were interviewed for the OpenEdX course entitled How to Learn Math. You might think anyone who was accepted into Stanford would be good at math (and feel good about their abilities), but not so. In fact, the professor (Jo Boaler) includes in the first class session an interview with a scientist from the UK who, when awarded a medal by the Queen, still harbored feelings of math inadequacy. The concept map is one of my first assignments. After listening to the students talk about their school math experiences, I created the concept map to capture the essence of their responses. I think it came out pretty well. I’m interested to see what some of the other 20,000 (!) students came up with and if anyone had a different take. Back to class! This entry was posted in Learning and tagged Concept map, Education, Karl Fisch, Learning, Mathematics on August 1, 2013 by galenaylor.